Discussion in 'Food Plots for Wildlife' started by Brow_Tine, Apr 5, 2019. I have a few perennial clover + chicory plots on our lease in SE Tennessee. I've noticed an interesting chicory usage pattern by the deer over the last few years. They mostly ignore the chicory until it bolts in the summer. Then they hammer the bolting stems and their flowers while mostly continuing to ignore the leaves. It's like the flowers are a treat of some sort. In late August and September, when a lot of natural browse has become less attractive, they start to nibble on the chicory leaves. Then sometime during the 2nd half of October or early November, they absolutely hammer the chicory leaves and eat the plants to the dirt. This is excellent timing for our archery and muzzleloader seasons. As far as the perennial clover goes, they pretty much eat that anytime it's available. They are much more selective with the chicory. I have the exact same results. They don't touch the chicory for the most part of the year for me and then come around October it gets eaten to the ground. I have also noticed that my deer prefer the Wina 100 chicory more than the others. My question is how are you going to get the chicory to grow by broadcasting it into a well established clover field? If the chicory seed doesn't have soil contact it might not grow. Let me know how this works out for you, I'm curious to see if you get a good germination overseeding into an established thick standing crop like clover. I find chicory does better if left high and not hit with the mower. The deer seem to hit it more thru the year this way and I'll give Native credit for showing that. I had minimal attraction of deer to chicory until I began to allow it to grow tall. 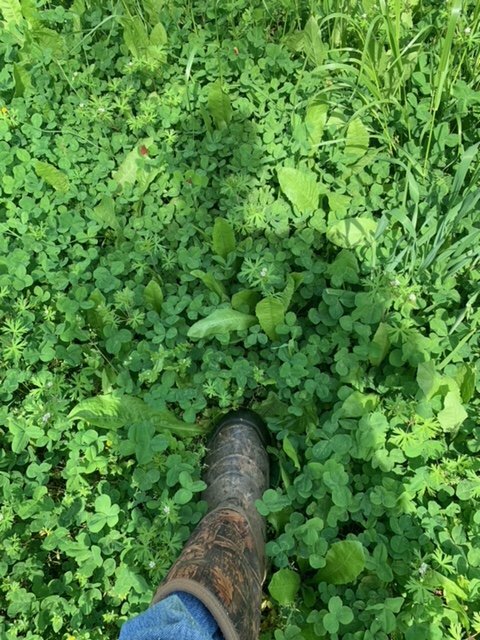 Since it is also mixed in with my alfalfa/clover plot on a ridge top, it and the alfalfa can weather dry spells really well with their deep roots as clovers tend to back off in the heat of the summer. BTW, you can overseed alfalfa also despite what most will say. I do it yearly to keep my 6+ yr alfalfa plot fresh. I also have overseeded chicory into perennial clover plots with great success. Usually do early spring when ground is pretty wet and the clover has not exploded in growth. I purchase some of my seed from Deer Creek and asked them the same question. This is the response. Mowing an adequately dense & established clover plot (or clover/grass) 2 times/year is a very good management tool to keep the foliage regrowing and a younger, lusher growth. This is more nutritious to the deer and most importantly is more attractive to the deer. To overseed in the spring with brassicas - including rapeseed - would be (or should be if clover is thick enough) pretty counter productive for the brassica. To put any annual and overseed into an established perennial plot is not a common practice. Not one that I'd recommend. Now, the chicory or even better yet, to diversify with a perennial modern forage grass can definitely MORE than compliment the clover plot - ie, high sugar perennial ryegrass. Early spring overseeding of that is very appropriate and is HIGH on my recommended list! You asked indirectly about brassica plant dates, planted in the spring or early summer and then mowing them to keep them fresh and invigorated with new regrowth. It is a near ART FORM to mow brassicas and not harm them & their regrowth capacity. That is the primary reason why early August is the far and away most common plant time for food plot (hunting) purposes = no mowing required for optimum deer attraction & nutrition. Hope this answers your questions and again I'd like to thank you for including DEER CREEK SEED for your food plot seed needs. I plant chicory with crimson clover. When the clover goes to seed, the chicory takes over. I don't mow because I also keep bees. The bees hit the crimson clover hard then move to Poplar blooms. When the Poplar is done, the bees move to the chicory and stay there all summer. These plots supply food for the deer all twelve months. I also find that deer continue to eat the chicory as it bolts. Mennoniteman and dogghr like this. While I understand Deer Creek response, they are not quite up to speed with many/most plotters who have done the monoculture foodplots in past years. Many of us now include a menage of plants in the same plot without worry of so-called competition between plants and even allow grasses and so-called weeds, gasp, to be present in said plots. I can show pics of my past plots that are magazine worthy of monoculture plots. We are not farming for profit, and a variety of plants within a plot simply provides a variety that can provide food nearly year round regardless of quirks in weather or pickiness of deer. I plant everything from brassica to grains to various clovers in the same plot. Deer haven't marched with signs complaining of the mix. Plus I'm making the AOC so happy as I'm so Green she has repainted her lips. Brow_Tine and Chipdasqrrl like this. This is fairly close to my experience as well. Deer love the chicory bolts and I see a lot more usage late summer early fall on the leaves than other times. It can be the best game in town after a dry summer when everything has gone tough and stemmy. I also saw a fair amount of chicory usage this February looking for sheds. Was a bit surprising. I like chicory and have it in every clover plot. The two work together well. I also am comfortable mowing it low with no damage to it and have it last for years...longer than most clovers. BTW, I've always found Dr. Harper to offer solid advice. Is the chicory mixed in with the clover or do you have sections or strips of chicory? I mix my crimson clover and chicory in with pelletized lime. I broadcast it with a 3ph broadcast spreader. my clover mix with chicory. it has a few weeds but the deer don't mind. I will spray the grass this week hopefully. Chipdasqrrl, cutman, Baker and 1 other person like this. Mowing clover twice a summer I can agree with. Quote (better yet, to diversify with a perennial modern forage grass can definitely MORE than compliment the clover plot - ie, high sugar perennial ryegrass. Early spring overseeding of that is very appropriate and is HIGH on my recommended list!) This is bogus, nobody puts forage grass or perennial ryegrass high on their deer planting list. The seed companies want to sell this stuff as bulk filler because it's cheap seed that they make a lot of profit on it, but it's almost invasive, and will take over a formerly good clover plot. MarkDarvin, Chipdasqrrl, TreeDaddy and 2 others like this. I thought the exact same thing when I read that. It is an easy and cheap sell to someone who isn't in the know. BOGUS...Good choice of words I agree as well. There's no way I am putting any grasses in my clover plots. I spray Cleth to get rid of it. When I read that I thought "Typical salesperson..they prolly have a ton on hand and need to move it"
Mennoniteman and shawn cox like this. Some of Paul Knox's work on high sugar ryegrass / Sweet Spot mix. We used to hear a lot about it for deer food plots, but haven't heard much about it recently. I think Paul determined that clover was just as good. I hate rye grass. It's all over my farm, vigorous reseeding annual , aggressive , of little value and almost impossible to get rid of. Deer will graze ir for a brief period but not worth it. I'll put wheat [ usually ] or elbon rye in light doses in clover plots for fall attraction. But rye grass is horrible down here. Chipdasqrrl and shawn cox like this. Brow_Tine, Chipdasqrrl, FarmerD and 4 others like this. Here’s another clover field I have. It’s durana, crimson, and chicory. It was full of honey bees when I checked it today. I don’t mow it...the deer are mowing it for me. FarmerD, Brow_Tine, Chipdasqrrl and 1 other person like this. Especially because it grows so easily... it’s included in a lot of throw & grow blends because there’s basically 0% chance of failure. As long as something green comes up, those that aren’t in the know will think the product was a great success. FarmerD and shawn cox like this.